Channeling precipitation away from vulnerable areas is an essential part of protecting your home. Unrestricted rain and snow can cause costly damage to your foundation. Anderson carries a full line of premium residential and commercial gutters in a variety of colors. 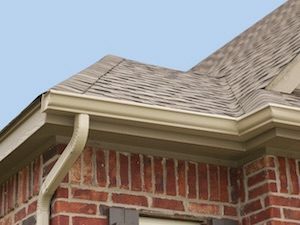 Our gutters aren’t just functional; they add curb appeal by wrapping homes in an eye-catching line. We work with seamless aluminum, seamless copper and seamless half-round gutters in order to fit your budget and style. 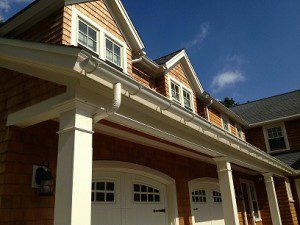 For the classic New England style, which is seen on 90% of houses, we count on Englert, a prominent name in seamless gutters and premium gutter accessories. Englert gutters carry a 20-year limited finish warranty on all installed gutter materials, covering blistering, flaking, chipping, cracking, peeling, splitting, rotting, red rust and structural deterioration as a direct result of manufacturing defects. We also trust Berger Building Supply for its dependable gutter and gutter protection systems, which help eliminate clogged gutters and downspouts. Berger has become known throughout the industry for offering a broad range of high-quality products at competitive prices. 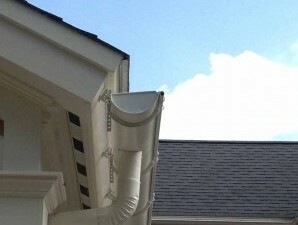 Along with installation, Anderson can remove and/or replace your home’s gutters. Having problems with your keeping your gutters clean? Ask us about the Leaf Relief gutter protection system.